What caused Niku and Drac to have a such strange orbit? The orbit itself isn't strange. It's easy to get highly inclined or even retrograde orbits by interactions with planets. What's strange is that there is an apparent clustering of several orbits. Six objects are known to share similar orbital planes with that high inclination, which suggests a common source and evolution. We don't know what would have caused that. The clustering should not be stable over billion year timescales because the orbits precess. It's not likely to be related to planet 9 because the distances are too large -- simulations show a planet 9 wouldn't affect them enough to keep them in the same orbital plane. We need to find and study a lot more of these to begin to tease out their origins. We lack a lot of data on them since most surveys stick to near the ecliptic plane. What do you suggest for a name for planet 9? I suggest "Maryanna" or "Terminus" Maryanna is a name I came up meaning that if the land and seas were to switch the Maryanna trench would become the world's tallest mountain, the reason I choose this meaning is that the planet is not like the other planets, orbiting in a large and strange orbit, in reality it's our system which is the opposite of the others we have observed, the name "Terminus" is a roman name for the god of borders. Maybe Planet 9 was captured recently as in millions of years? Or thousands, If I recall correctly there was a star which was close to our solar system about 850,000 years ago, don't remember the name though, could have been orbiting that star. 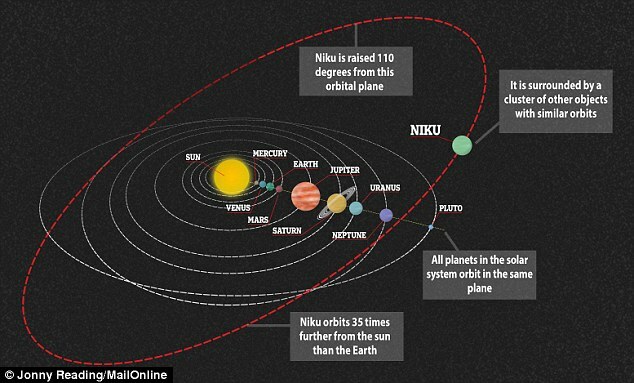 Does Niku orbit close to Neptune? I didn't see an orbital graph for it, if it does, it probably had an encounter with it or was hit by another object which moved it's orbit or something, but something in a orbit like that might not even be natural, it could be artificial, not sure if that makes sense, it was discovered recently so there is lots of speculation about it until we know for certain. my suggestion for a name is the continue call our solar system planets with roman gods names. Orcus is already an object, a dwarf planet/asteroid. Maybe Hades? If planet 9 is real it should be named something that starts with "P" so the classic planetary mnemonic will remain valid. Rename it to Pluto, and then rename Pluto to something else? a quality that evokes pity or sadness. Damn, even if you don't consider Pluto a planet, it's worth sending more missions to it, Pluto will always be an honorary planet in my view, simply because it was the first in a class of new objects which I mainly grandfather in, 21 planets give or take. To me astronomy is a personal thing and I define the things I see my way, others do as well, so be it. When I got my first telescope I was amazed, I saw sights that weren't seen hundreds of years ago, so amazing the feeling of looking through one. Pluto should be renamed "Cupid" because of the heart like feature on it, who would have expected that when it was discovered? When we saw it for the first time, we expected a dead dreary world, how wrong we were, that is exploration, and we need to explore more of these objects, I want to see missions to "dwarf" planets, and asteroids, we have discovered the main stuff in our system, now we explore them, especially sedna, it reaches it's perihelion at about 2072 give or take, it's our chance, so we should take it, send out a wave of these missions, all at around the same time, that would be interesting. That's not a dis on Pluto as an object -- it's fascinating and beautiful. Rather, it's poking fun for it being demoted from planethood, and now discussion of it loosing its classic name to boot! Poor Pluto! Pluto has a heart, something more dark, mysterious, and further unknown constitutes death, Pluto is named after the god of the underworld, we should rename pluto, since how is a planet with a heart representing the underworld when there is even more of an underworld? I still like the name Maryanna, something I came up with. I really wish our solar system had more interesting planets, what would have done differently? I find Tartaros would be the correct name for Planet Nine. As I have already suggested here. Renaming Pluto when it has a profile of Pluto on it? What if we find a planet even further out? Btw they just named it 2011 KT19 which makes 0 sense at all, it wasn't even discovered in 2011, and what constitutes the letters? Just name it Niku instead.